A mom recently left this comment and I thought many other women likely have the same question. Keep in mind that this article does discuss American law which may not be applicable to other countries. First thank you for your site! I’m under the care of an OB who practices at a hospital that does not “allow VBACs” but has stated the only way to deliver at said hospital is to show up in labor & pushing. The College says that restrictive VBAC policies should not be used to force women to undergo a repeat cesarean delivery against their will if, for example, a woman in labor presents for care and declines a repeat cesarean delivery at a center that does not support TOLAC. If a patient (Me with 3 prior sections), presents one’s self in labor at said hospital and declines a section, the hospital then has to heed the wishes of the patient? Am I understanding this correctly? Does the hospital have the right to stop contractions and section the patient? This is what I’m hearing in my birthing community and I really cannot believe a hospital would/could do that. Many women believe that all one must do to prevent an unwanted cesarean is declare, “I do not consent!” While technically true, you are entitled to control what happens to your body, the reality is, it often doesn’t play out that way. A hospital does not have a legal right to perform a cesarean on you without your consent. However, it still happens either by coercion or lies and even more rarely, by court order. I think part of the problem is, many women are not familiar with ACOG’s guidelines. As a result, they don’t understand what ACOG recommends and discourages. 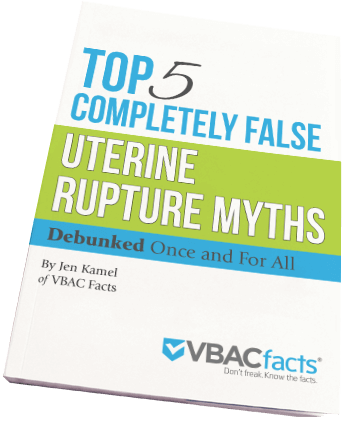 (For example, many women believe that VBACs should never be induced. That is false.) Women frequently take their OB’s word as the truth. However, ACOG’s recommendations are often obscured by unsupportive care providers to mimic what the care provider wants the mom to think ACOG says. In other words, unsupportive care providers want moms to think that their options are limited per ACOG and that is just not the case. The fact that you are doing your research gives you a massive advantage over women who just take their OB’s word for it. I highly recommend you review the article I wrote about a mom who was threatened with a forced cesarean after her OB withdrew support of her planned VBA2C at 37 weeks. It includes legal and media contacts. Through the help of the ACLU, ACLU Women’s Rights Project, National Birth Policy Coalition, and National Advocates for Pregnant Women, the mom was granted a trial of labor. I use the (demonized) term TOL because the mom ultimately did have a medically necessary cesarean during labor due to a placental abruption. However, the mom was still happy that she had the opportunity to labor. This answer is true for all women, not just this one. If she needs legal advice specific for her situation then she should consult an attorney. You have the right to refuse any treatment you do not want. I am sure that what she is hearing is the same horror stories that we hear of a mom being harassed by the doctor and staff to consent to a c/s or threatening to seek a court order or call CPS. I know this is a scary thought to have to deal with any of these scenarios, but fear of something happening should not keep you from exerting your legal rights, unless you really are okay with what you are consenting to. You cannot assume that the staff is not going to honor your refusal. They are people just like us, some are jerks and some are ethical and will follow your refusal, but you won’t know what you are dealing with until you are in the moment. ACOG guidelines are just that, guidelines, they are not law; while it is nice when they put out a guideline that supports your factual situation, falling outside of their recommendation does not mean you must consent to something you do not want. Lisa presented at the 2012 VBAC Summit in Miami. I found out that my son was breech at 35 weeks and despite every thing we tried he stayed that way and my midwife said she could not do my home birth and sent me to see a Dr. who delivered at Tampa General Hospital. And of course the Dr started talking about c-section and I told him I didn’t want it. and then he went on with the whole “dead baby” scares when trying to birth a breech baby, and I still said I didn’t want to, but now my husband was convinced that our baby was going to die if I tried a breech delivery. A few days later the Dr called me from the hospital saying that the hospital would not let me have a breech delivery and could even try and enforce a c-section by court order if I go in there in labor and if the baby was still breech. Thinking about it now, I should have told the guy to F*** off but the thought of being in labor and being harassed by Dr’s and lawyers and court orders during a time when I’m extremely vulnerable scared me into submission. I felt I had no other choice especially with no one on my side about it. If I knew then what I know now, things might have been very different. I am a midwife, and I am hearing this sort of thing more and more. I also have my own personal experience dealing with this issue. 22 yrs. ago, I had an emergency c-section with my 5th baby. I had a vbac with my 6th, born 18 mos. later at home. I then had another emergency c-section, for a totally different reason with my 7th baby. I had a vbac at home with my 8th, and last baby at age 41. That was my fastest and easiest labor and he weighed 10 pounds. I’m in the same situation where my doctor waited to tell me the hospital doesn’t seaport VBAC and he will not be doing wat I wish for until my 39th weeks of pregnant! and now I’m at the end of the roat and no doctor wants to take because I’m dues so soon. What should do? If you could send me at email I would really appreciate.